Background: Services have tangible and intangible aspects. Services are organized as a system of conceptual ideas (space of possibilities) and are enacted through social and physical arrangements (possibilities of space). Games are employed in service design to expand the space of possibilities with new insights; however, the possibilities of space are sometimes not recognized, experienced, or realized through these games. Method: Game sessions were organized to support the co-design of three services: medical imaging diagnosis, hospital care, and environmental education/leisure. A case study for each project is provided, with the focus on the spaces produced by the participants’ interactions. Results: Even as participants were designing services for the future, they realized the possibilities of space in their current services and made use of these soon after the game sessions. Transformative actions initiated in the co-design sessions went beyond play, reaching the work activities that sustain the services. Conclusions: Games in service design can be insightful as much as transformative.Game spatiality, in particular, can lead participants to make use of the possibilities of space not conceptualized before, which are outside of the space of possibilities. Amstel, Frederick M.C. van and Garde, Julia. 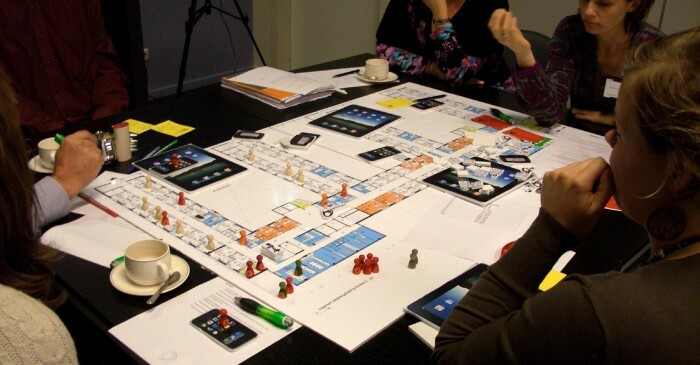 Games to explore the possibilities of space and the space of possibilities in service design. Simulation & Gaming, 47 (5), 2016, p. 628-650.